Portland homicide detective Skin Kadash just wants to survive treatment for bladder cancer long enough to get back to work. But when his partner asks him to look into a series of deaths, he’s not interested — he’s sick and doesn’t need the grief — until she tells him the victims all suffered from cancer and all were being treated by the same doctor treating Skin. 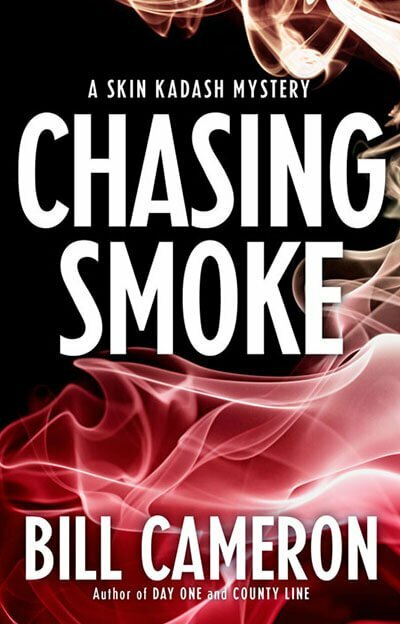 Read an excerpt from Chasing Smoke. Portland homicide detective Skin Kadash just wants to survive cancer treatment so he can get back to the work he loves. When his partner tries to drag him into an unofﬁcial investigation of a series of deaths, he’s not interested — he’s dead-dog sick and doesn’t need the grief — until she reveals the victims all suffered from cancer themselves, and all had one thing in common with Skin. His oncologist. The deaths are all apparent suicides; the police have closed the book on them. Then a mysterious young woman, daughter of the first victim, surfaces and insists the dead men were all murdered. Before her story can be probed more deeply, she disappears, leaving Kadash with no support from the cops and little to go on except a nagging belief the missing woman knew more than she revealed. Kadash is left to chase elusive leads among the bitter and broken widows of the dead men. Struggling with his own illness and with a growing rift between himself and his partner, Kadash finds himself entangled in a web of resentment, jealousy, and deceit. Ultimately, he finds that not is he only seeking a missing woman and the truth about the dead men, but also the meaning of his own life in the face of his impending mortality. Check out this video review by Reading Sarah: The Awkward Librarian. ★ “Highly recommended.” — Chasing Smoke receives a Starred Review from Library Journal. “…an instant mystery classic with vivid characters crafted with realistically deep personalities and secrets that keep you guessing to the very end,” saysThe Clarion in Madison, Wisconsin. “[T]his was both a sorrowful and engaging read that was well worth the cover price,” says Stephanie Padilla at the New Mystery Reader. Whatever Happened to Death With Dignity? I’ve received a number of queries asking, “Will we ever get to read Death With Dignity?” The answer is yes. Before release, the book got a new title. Death With Dignity became Chasing Smoke.